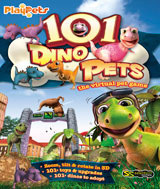 Adopt a dinosaur as your very own pet! Teach your dino to dance, jump, fly and more, and reward your pet with a treat after each trick. Enter your dino into pet shows to earn fun upgrades, including toys, food and furniture. Dress up your dino in cute clothes, take it to the vet for checkups, go to the park, romp in the yard and more. Plus, with 3D views you can zoom in, zoom out, tilt and rotate to watch your pet, up close and personal! Includes 101+ in-game toys and upgrades, full 3D environments and textures, saved games and more.